Many of today’s carpets can withstand pets, kids, and heavy traffic. 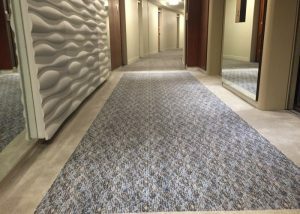 Not only is carpeting a big investment, having commercial carpet installed in an area of high traffic like a corridor can be a big hassle. That’s why we recommend you choose a high-quality carpet that will last for many years. Look at the face weight, density rating, tuft twist, and the construction. 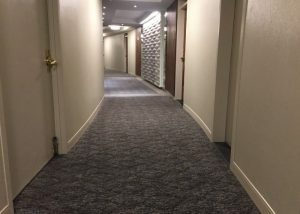 We have been providing sales and installation of commercial flooring products to the following market segments for over 35 years: Corporate, Education, Hospitality, Government and the commercial real estate community. 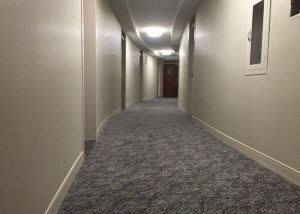 Eagle Mat also offers turnkey services that include painting, carpet replacement and furniture moving – specializing in modular furniture lift work. It’s easy to contact us, and we’re happy to help. You can always call us at (301) 762-2000 or email us at sales@eaglemat.net for more information.